Sure, anyone can give you an instant breakdown of Nebraska’s Spring Game, feeding you the hot takes and farming for your sweet, sweet clicks. But we at the Double Extra Point know you come here for reasoned and thoughtful analysis, the kind that takes some time to generate. OK, fine, I’ve been really busy, and a little bit lazy. But there is some value of taking a breath and looking back at where Nebraska football is after head coach Mike Riley’s third spring in charge. Here’s four big takeways as we prepare to go through the long dark summer of baseball, cookouts, and hot-weather tomfoolery until football starts back up in August. Riley isn’t going to get much breathing room even with all the changes coming to Lincoln this autumn. He’s going into year three of his tenure, after a 5-7 season in his first year and going 2-3 to end his second year with an aggregate score of 140-37. Riley isn’t on the hot seat for 2017, but he may very well be a year away from it. And yet, there very little about 2017 that will look like 2016 in terms of the team taking the field. New defensive coordinator Bob Diaco will be deploying his much-discussed 3-4 defense, and we won’t learn anything about the Blackshirts’ transition until Arkansas State comes to town. And Nebraska’s signal-callers are going to look different than … well, just about any time in NU’s recent history. Shortly after the Spring Game, Riley said junior transfer Tanner Lee would be Nebraska’s starter going into fall camp (according to Sam McKewon of the Omaha World-Herald). Behind Lee will be redshirt freshman Patrick O’Brien and sure-to-redshirt freshman Tristan Gebbia. All three were impressive in spring practice, and showed well at the Spring Game. But it was Lee who had the highlight of the contest, with a 30-yard touchdown pass to JD Spielman that brought a collective gasp to the Memorial Stadium crowd. That’s … a throw Nebraska fans aren’t used to seeing their quarterback execute. So Lee being the first name on the sheet isn’t a surprise. But Nebraska’s quarterback depth now is as good as it’s been in quite some time – maybe since Tommie Frazier and Brook Berringer. Given what’s happened to Nebraska in the last few years when its starter went down, it’s hard not to see this season as something very different in terms of NU’s offense. But with a quarterback like Lee (or O’Brien, or Gebbia) as opposed to the run-first guys like Taylor Martinez or Tommy Armstrong, and with the shift in defensive scheme, Nebraska is going to look very different in 2017. Anyone who thought they were going to get a glimpse of what Nebraska’s 3-4 defensive attack was going to look like in 2017 were sorely mistaken. At no point in the Spring Game did Nebraska come out in a three-man front, playing lots of nickel, and generally being super plain and boring with its defensive alignment. That was by design. Diaco, and Riley, made a conscious decision to keep the Blackshirts’ new look under wraps to avoid giving opponents an off-season worth of film to study. At one level, that’s kind of silly. A 3-4 defense isn’t exactly revolutionary, and any competent offensive gameplan will at some level know what’s coming and how to defend against it. Having said that, though, at least some of the benefit of a 3-4 scheme is deception, with an offense not knowing from down to down where the fourth pass rusher is coming from even without a blitz. And given that Nebraska will be breaking in a new defensive structure (as well as a new offensive structure), any tiny little advantage might be helpful. OK, sure, there’s no such thing as a “known” in recruiting, especially before national signing day. But still, what’s happened with Nebraska’s recruiting in the last few weeks is nothing short of remarkable. Nebraska is currently sitting at no. 11 nationally (according to 247 Sports) with its 2018 recruiting class. Led by Brendan Radley Hiles, the sixth-best prospect Nebraska has signed since 2000 (! ), the class of eight commits to date should be filling Husker hearts with hope about the talent coming to Lincoln. After watching the NFL Draft, and seeing Nebraska break its streak of 54 years with multiple players selected, it’s hard not to come to the cold realization that NU’s talent pool had thinned in recent years. It appears that trend is reversing. But still, a note of caution should be heard. While Nebraska is rated no. 11 nationally, that’s still only good for fifth in the B1G. One spot behind Minnesota. So, take those numbers for what they’re worth. Nebraska fans could be forgiven for being a little confused about what to think about their team. In 2015, the team wasn’t nearly as bad as the 6-7 record would have suggested, suffering one inexplicable loss after another. In 2016, the team likely wasn’t as good as the 9-3 record would have suggested, as evidenced by lopsided losses to Ohio State, Tennessee, and (shudder) Iowa. Nebraska’s 2017 squad shapes up to be very different, and perhaps more dangerous, than Riley’s two previous teams. But the schedule it faces also looks to be more challenging than the previous two years. Consider Nebraska’s road trips to Oregon, Minnesota (you know, the team with the no. 10 nationally ranked recruiting class) and Penn State, with home contests against Wisconsin, Northwestern, Ohio State, and Iowa. The three most difficult contests are likely at Oregon, Ohio State, and at Penn State. If Nebraska drops those three games – not at all an unreasonable expectation given NU breaking in a new offense and a new defense – then it will have to run the table just to match 2016’s achievement. That would include wins over Wisconsin (which hasn’t lost to Nebraska since 2012), Northwestern (which perennially plays Nebraska tough) and Iowa (which hasn’t lost to Nebraska since 2014). It’s very likely Nebraska’s 2017 team will be better on offense, and perhaps on defense, than the 2016 squad. It’s also very likely that the 2017 record won’t reflect that improvement. Photos of the 2017 Spring Game can be found here. On Saturday, Nebraska will have its fifteenth and final spring practice play the annual Red-White Spring Game before a crowd likely to be north of 80,000 in Memorial Stadium. As year three of Mike Riley’s tenure as Nebraska’s head coach begins, fans will be wondering what to expect after last year’s record was an improvement over the prior season, but saw some ugly losses to Ohio State, Tennessee, and (shudder) Iowa. Can The Quarterbacks Complete Passes? The last three years, of course, were with Tommy Armstrong as starting quarterback. And those numbers are simply not good enough for Nebraska to expect success on the field. This year, with Armstrong’s departure, the quarterback battle looks to be between redshirt junior transfer Tanner Lee and redshirt freshman Patrick O’Brien. Lee played two years at Tulane, and many fans hope his experience will help him win the job and lead Nebraska’s offense out of the doldrums. His career stats? A 53.6 completion percentage and a 23/21 TD/INT ratio. Sure, that was at Tulane, not Nebraska. But still, those aren’t numbers that inspire confidence. With the threat of a quarterback run game now gone, Nebraska will need significantly more efficient play from the passing game to be effective on offense. Whether the starter is Lee or O’Brien, we will at least get a glimpse of what to expect from them on Saturday. Can The Offensive Line Hold Up? Nebraska’s passing game was a mess last year, and much of that comes from the signal-callers and their limitations throwing the ball. But part of the problem has been an offensive line that has struggled to perform at a high level. Injuries were a part of the problem last season, of course. But it’s rare to finish a season without some attrition on the offensive line from injury. Going into Saturday, we do not yet have a good grasp on who will be starting up front on offense. We also don’t know exactly how the Red and White squads will be divided, so it may very well be that a full first-team offensive line won’t be on the field at the same time on Saturday. But we will get at least some look at how this year’s version of the Pipeline will look come September. Can The Running Game Get Established? Yes, it’s fair to say that this question will hinge in large part on the answer to the last question about the offensive line. But it’s also fair to say that Nebraska has a whole bunch of I-Backs to pick from, none of whom have yet to show the ability to take over a game. For the three primary returning backs, here’s their yards per carry from 2016. Last year, Nebraska had the no. 73 ranked rushing attack nationally – and that was with Armstrong’s running ability factored in as a part of the offense. This year’s offense will likely not feature a quarterback run game, but will (hopefully, for Nebraska’s sake) have a more efficient passing attack. On Saturday, we will get at least a glimpse of how that effects Nebraska’s ability to run the ball. Will The New 3-4 Defensive Scheme Take Time To Learn? Those were the scores of Nebraska’s last three losses (to Ohio State, (shudder) Iowa, and Tennessee), and were a significant factor in why Bob Diaco and not Mark Banker is Nebraska’s defensive coordinator in 2017. But it’s not like Nebraska was dreadful on defense overall last year. NU was no. 30 nationally in total defense, and no. 33 in scoring defense. So, on the good side, that means Diaco has a good platform on which to build. But, on the concerning side, it also means that a substantial shift in defensive scheme (from 4-3 to 3-4) runs the risk of upsetting the proverbial apple cart. OK, sure, a smart reader like you might expect that Diaco wouldn’t come out with a quote like “hey, Nebraska opponents, make sure to check out the Spring Game because we’re totally going to show you all our sneaky trick defensive plays.” So of course what will be on the field this Saturday will be a pretty sanitized version of the Blackshirts compared to this September. Can Nebraska Generate Pressure on the Quarterback? While we should be able to learn something about Nebraska’s new-look Blackshirts on Saturday, it is fair to say that we might know less about Nebraska’s ability to pressure the quarterback in 2017. Even if the offensive line is a question mark (see supra), it is unlikely that Nebraska will be calling any elaborate blitzing or pressure schemes. Still, one of the advantages of a 3-4 front is to permit even four-man pressure from multiple locations, potentially causing confusion to opposing offenses (as discussed by Kaipust of the Omaha World-Herald). And Nebraska could use the help on that front, checking in at no. 65 nationally in sacks and no. 85 in tackles for loss last year. So even without the blitzes or other extra schemes, getting a look at how a 3-4 front attacks an opposing offense should give fans at least a taste of what’s to come in 2017. This week, ESPN released its Football Power Index (FPI), an analytical tool that simulates thousands of college football matchups to predict future outcomes. The FPI results for the 2017 season are out and they are … not optimistic for Nebraska. The FPI thinks that Nebraska will win somewhere between 5.5 and 6.5 games in 2017, making it no. 58 in the nation. In looking at the schedule next year, that’s a lower rating than Ohio State (no. 1), Penn State (no. 8), Oregon (no. 21), Northwestern (no. 29), Iowa (no. 39), and Minnesota (no. 55). Reactions on Husker message boards were, of course, calm, measured, and grammatically accurate. Basically, they broke down into archetypes. Grizzled Old-School Husker Fan: Bah, what do those eggheads know about a game played on the field! Snarky Hipster Husker Fan: Gee, can’t wait to watch that exciting half-a-loss Nebraska gets this year. Angry Message Board Husker Fan: ESPN HAS ALWAYS HATED USSSSS!!!!!!11!!!!1!! Husker Fan Pining For Previous Coach: It’s all because we fired Bo. Husker Fan Pining For Previous Coach, Five Years Ago: It’s all because we fired Callahan. Husker Fan Pining For Previous Coach, Ten Years Ago: It’s all because we fired Solich. But the FPI results shouldn’t be a surprise. Here’s how ESPN describes the methodology for the FPI rankings. The model comprises four major components: the last four seasons of performance on offense, defense and special teams, with the most recent season counting most; information on offensive and defensive returning starters, with special consideration given to a team returning its starting quarterback or gaining a transfer quarterback with experience; a four-year average recruiting ranking of four systems (ESPN, Scouts, Rivals and Phil Steele); and head coaching tenure. These four components interact and are assigned different weights depending on the team to produce preseason FPI. Combining all of the factors above produces a predicted value on offense, defense and special teams, which represents the number of points that each unit would be expected to contribute to the team’s scoring margin if it were to face an average FBS team on a neutral field. Bill Connelly from SB Nation (and the robot from the incredibly entertaining Podcast Ain’t Played Nobody) released his 2017 S&P+ preseason ratings, which consider recruiting, returning production, and recent history. That formula has Nebraska at no. 42 nationally, behind Ohio State (no. 2), Penn State (no. 8), Wisconsin (no. 11), Oregon (no. 23), and Northwestern (no. 37). So the computers hate Nebraska in 2017. Why? Well, first of all, the Nebraska that takes the field in 2017 will bear almost no resemblance to the 2016 squad (which may either relieve you or terrify you, based on your perception of last year’s team). Quarterback Tommy Armstrong, the undoubted engine of whatever offense Nebraska could produce last year? Gone, replaced either by a Tulane transfer with a career completion percentage of 53.6 percent and a 23/21 TD/INT ratio, or a redshirt freshman who has never taken a snap in a college game. Wait, there’s more. Nebraska’s leading rusher? Gone. Leading receiver? Gone. Third leading receiver? Gone. Fourth leading receiver? Gone. Any tight end on the roster with a career catch? Gone. Remember, analytics in general and the FPI in particular look at returning production to “decide” how good a team will be going forward. Nebraska, outside of receiver Stanley Morgan, has basically no returning production. So it shouldn’t be a surprise that the analytics don’t think much of Nebraska’s chances in 2017. So take another look at Connelly’s S&P+ preseason rankings. They rank Nebraska no. 22 nationally in recruiting, no. 32 nationally in a five-year average (thank you, 2015), but no. 72 nationally in returning production. That explains, almost entirely, how Nebraska ends up in the mid-forties overall. Does that mean Nebraska can’t be successful in 2017? Of course not. But it highlights the danger that could burst Husker Fans’ bubble of optimism – that we really don’t know what to expect from the guys wearing the scarlet and cream next year. Tanner Lee might tear things up next year and make Nebraska’s new passing attack thrive. But we don’t know, and we won’t know until the season plays out. And the analytics are giving us a preview of what the national pundits will likely do as the season gets closer – show that Nebraska has lost the benefit of the doubt. Remember, Nebraska hasn’t won a conference title since 1999. Nebraska hasn’t been competitive in a conference title game since 2009, and needed a once-in-a-generation player like Ndamukong Suh to get that close. If and when Nebraska gets back to the point where it can legitimately compete for conference titles, the national spotlight and the benefit of the doubt will be back, rest assured. Nebraska is still a legacy name, like Alabama was when it labored under the tutelage of Mike DuBose, Dennis Franchione, and Mike Shula before some guy named Saban showed up in Tuscaloosa. But Nebraska ain’t Alabama, at least not yet. And until Nebraska can show it won’t wilt under the spotlight, don’t expect the national college football audience – or the analytics – to give Nebraska the benefit of the doubt. Nebraska football fans know that the quarterback is the most important part of an offense, so the teams with the best quarterbacks will be the hardest to beat. Next season, Nebraska will face a number of talented signal-callers as new head coach Mike Riley learns the ropes of his position. Here are the five quarterbacks Nebraska is likely to have the most trouble with next season. It seems odd to think of a quarterback from the offensively-challenged Gophers to make this list. But Leidner led Minnesota into Lincoln last year and beat Nebraska, so NU fans should think twice before dismissing his ability. Leidner’s statistics aren’t jaw-dropping (51.5 percent completion rate, 11/8 touchdown-to-interception ratio in 2014). But in Jerry Kill’s smash-mouth offense the quarterback does not need to be the primary weapon. Instead, the quarterback merely directs the offense and makes plays when necessary. Which is exactly what Leidner did last year against Nebraska, going 8-of-17 for 135 yards through the air, and carrying the ball 22 times for 111 yards on the ground. If Leidner is able to match those numbers against Nebraska this year, NU will struggle to avoid a third straight defeat. Injuries derailed Lunt’s 2014 season at Illinois after transferring from Oklahoma State. Even in the eight games he played last year, though, Lunt amassed a 63.5 percent completion rate and a 14/3 touchdown-to-interception ratio. Those numbers are enough to make any defensive coordinator nervous. Although Illinois’ weapons are certainly limited, a healthy Lunt will be able to get the best out of them, and provide a challenge for Nebraska’s new-look defense. Much like Illinois’ Lunt, injuries robbed Hill of what could have been a darkhorse Heisman candidacy last year. Hill’s primary threat is with his legs, having rushed for 463 yards on 86 carries and scoring 8 touchdowns in only seven games last year. But Hill is also effective as a passer, with a 66.7 completion rate and a 7/3 touchdown-to-interception ratio. Hill’s dual-threat skill set represents a huge challenge for opposing defenses, and the fact that he is the first quarterback Nebraska will face under Riley’s leadership makes him all the more dangerous. It’s not like Kaaya had a bad game against Nebraska last year. 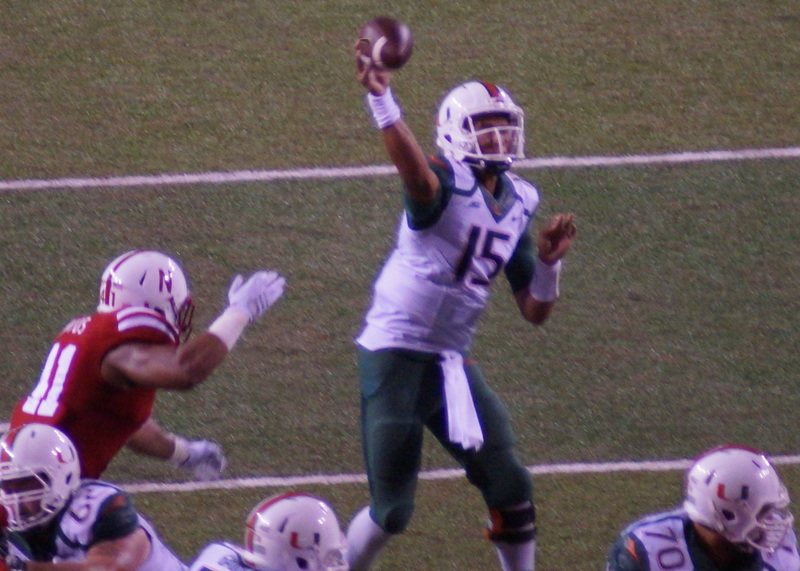 As a true freshman in a hostile atmosphere, Kaaya went 28-of-42 for 359 yards passing and three touchdowns. But he also threw two interceptions, and that in combination with Miami’s inability to stop Ameer Abdullah helped Nebraska to a ten-point victory. But in 2015, the game will be in Miami. Abdullah will not be wearing scarlet and cream, and Nebraska will be taking its first road trip under Riley. Kaaya will have a full year of experience under his belt, while Nebraska will be in only the third game learning a new defensive scheme. And Miami will be looking for payback after a chippy game in Lincoln last year. Cook probably doesn’t get the respect he deserves. He’s not flashy or gaudy, and Michigan State is much more known for its defense than its offense. But NFL scouts have their eyes on Cook. CBS Sports has Cook as the no. 1 quarterback prospect for 2016, and Walter Football projects Cook as the no. 6 overall pick in next year’s NFL Draft. Between those lofty projections, and the salty defense he will have protecting him, Cook will provide Nebraska with the sternest challenge as a signal-caller in 2015. Nebraska football fans are not alone in feeling burned by the recruiting process. After spending months getting excited about four- and five-star prospects arriving, fans have to wait—sometimes for years—before those prospects actually produce something on the field. A new season, and a new head coach in Mike Riley, is on the horizon. So let’s take a look back at Nebraska’s recent recruiting history and see which highly-touted recruits might get their chance to come good for NU. Star and composite rankings from 247 Sports. Class of 2011, four-star, .9658 composite. In 2011, Turner showed up in Lincoln intending to compete with Taylor Martinez for the starting quarterback position. When that didn’t work out, Turner moved to wide receiver. Between struggles with learning the position and recurring injuries, Turner’s career at Nebraska has never caught fire. But being given an extra year’s eligibility through a medical hardship gives Turner a new lease on life. 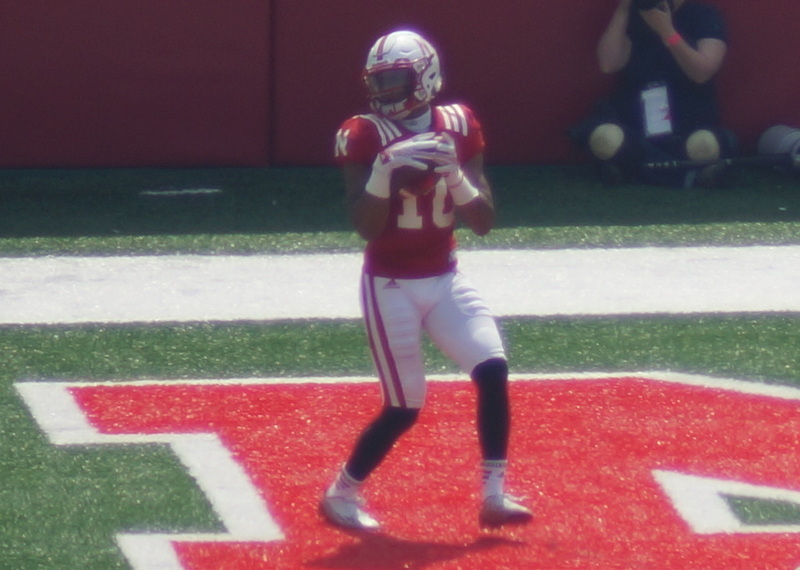 Turner will likely be a starting wide receiver along with Jordan Westerkamp (more of a possession receiver) and De’Mornay Pierson-El (whose slight frame should limit his usage). This provides a huge opportunity for Turner to make a big impact in his swan-song season. Much like Turner, Jackson’s career in Lincoln has been a struggle with injuries. In August of 2014, when he was in line to be Nebraska’s starting nickel back, Jackson suffered a knee injury that cost him the entirety of the season. His misfortunes with injuries have continued into 2015, with another knee injury keeping him out of spring practice. But according to John Taylor of NBC Sports, this time around the injury isn’t as serious and Jackson should be at full strength coming into fall camp. Jackson will be competing in a crowded and talented backfield for playing time. But he’s also a freakish athlete who will have every opportunity to earn his moment in the sun. It’s not unusual for offensive linemen to take time before they are ready to produce at a collegiate level. Indeed, it’s the rare player who is able to contribute in the trenches as an underclassman. But Thurston looks ready, after seeing limited time as a backup last season, to press for the starting job at center in 2015. With a line that will be looking for experience after losing starters at both guard positions, having Thurston emerge and produce at center would be a huge boost for Nebraska’s offense in 2015. When Riley was hired, much was made of Banderas’ status with the Nebraska program. Lee Barfknecht of the Omaha World-Herald discussed how Banderas was close to leaving the program after being “jerked around” by former head coach Bo Pelini’s staff. Steven M. Sipple of the Lincoln Journal-Star wrote about Banderas being “mismanaged” by Pelini. Given that track record, a new coaching staff would be reason enough to be optimistic about Banderas’ prospects in 2015. But when you combine that with a thin linebacking corps (Nebraska in 2015 will have five scholarship linebackers who are not true freshmen) and a quarters defensive scheme from new coordinator Mark Banker that focuses on three linebackers on the field, and Banderas’ opportunity next season becomes apparent. Newby has always been a tantalizing talent for Nebraska fans. He was a higher-rated prospect than Randy Gregory (according to 247 Sports), and has flashed the kind of game-breaking speed that could make him a dominant threat at I-back. But Newby’s performance hasn’t matched that promise. A big part of that is being behind Ameer Abdullah in Nebraska’s backfield, of course. Newby has averaged just 4.65 carries per game, and has averaged 4.9 yards per carry. This year, though, Abdullah is gone and Newby looks primed to win the starting I-back job (according to Sam McKewon of the Omaha World-Herald and a certain smart and particularly handsome analyst). While Newby will have a crowded backfield competing with him for playing time, 2015 looks to be his year to shine.